Seven is revered around the world as being one of the most important numbers, and one of the luckiest. There are seven days in a week, seven colours in the rainbow, seven continents, seven seas and seven lucky gods in Japanese mythology. 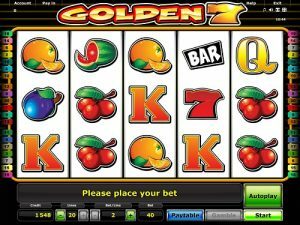 In Golden 7, it’s the definitely the number which you want to be falling on the reels as it gives the biggest payouts! Come on, lucky number seven! In this old-school slot, brought to you by NovomaticCasino.co.uk, you’ll find all of your familiar and favourite slot symbols: fruits, such as the lemon, orange, cherries and watermelon; cards including the King and Queen; the golden bell; the bar; the red seven and the golden seven! The fruits and the golden bell are the lowest-paying symbols and the Queen, King, bar and red seven are the highest respectively. The golden seven is the luckiest symbol to spin as it changes any Queen or King into a red seven – giving you a bigger win! There is also a turquoise Wild symbol which substitutes for any symbol except the golden seven itself! Players who enjoy other NovomaticCasino.co.uk slots, such as: Fruit Fortune, Ultra Hot Deluxe and Golden X Casino are bound to fall in love with Golden 7 as soon as they start playing. Golden 7 is also a great slot for well-seasoned slots players who are looking for a game without too many complicated rules or puzzling bonus games. On top of that, any beginners who are looking to upgrade from a simple 3-reel, 5 payline slot will find this just the ticket – it’s the right amount of challenging! Your balance, winnings and bet amount are all clearly displayed for you and you can change your bet at any time by increasing or decreasing both the number of lines you wish to bet on, as well as the amount you wish to bet on each line. You can consult the paytable to see how much each symbol will pay out depending on your bet, and for more information about the game. Similar to most other NovomaticCasino.co.uk games, you can play Golden 7 for fun until you’re ready to play for real and start winning real cash! Once you’re happy with your bet amount and feel like you’ve got lucky number seven in your pocket, you can use the game’s ‘autoplay’ function and watch as the reels spin for you. A zero-effort win has to be the sweetest of them all! Golden 7 also has an exciting gamble feature which enables players to turn even the smallest of payouts into great sums. Whenever you get a payout, you can opt to collect or gamble it. If you choose to gamble it, you can double your win amount, quadruple it or more! All you have to do is, on each level of the gamble game, click the bar whilst it’s flashing on. If you time it correctly, you’ll double your amount and move up to the next step! But, be careful, if you click whilst it’s flashing off, you’ll be back to square one and onto the reels without your win. Can you make it to the top? Let’s see! Here at NovomaticCasino.co.uk, we’re not all about slots and video slots! We also have a great selection of table games, including the likes of Royal Crown 3 Card Brag, Royal Crown Blackjack, Multiball Roulette and Sic Bo. They offer fantastic RTP (return to player) percentages and playing them is a great way of broadening your gaming horizons. What’s more, our live dealer games, such as: Live Blackjack and Live Poker, are so engrossing and evocative that you’ll feel as though you’ve stepped right into a glamorous casino from your very own computer. How’s that for a bit of magic?